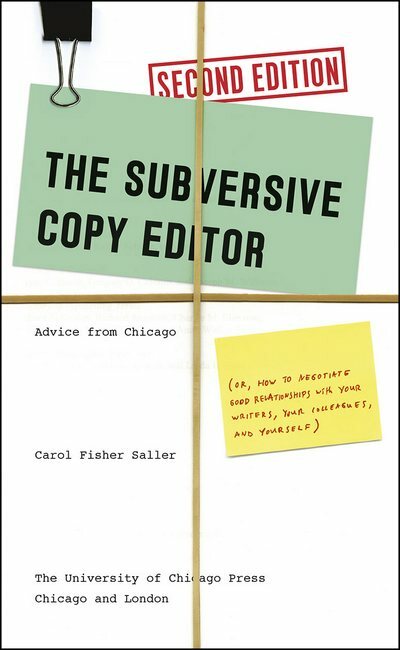 One of the books I found most helpful when I began freelance editing was Carol Fisher Saller’s The Subversive Copy Editor. Unlike style guides and other trade references that editors consult more or less daily, Saller’s book focuses not so much on how to copyedit as on ‘how to survive while doing it’. I’m happy to report that The Subversive Copy Editor was recently published in a second edition. Two chapters longer and noticeably heftier, it still falls well under 200 pages: you’d zip through it in a day or two. It’s full of solid advice on such aspects of the job as managing deadlines, handling pressure and difficult clients, improving your computer use (e.g., filing, word processing), and email etiquette. Many editing decisions at the beginning of a document turn out to be the wrong ones in light of what followed; you will know and understand the writer and the content better when you’ve finished reading. There’s no end to the amount of fussing you can do with a document, whereas there’s a limit to the amount of money someone will pay you to do it. At some point it has to be good enough, and you have to stop. Much of this fussing owes to editors’ fixation on ‘correctness’. But by covering a page with ‘unnecessary and counterproductive little edits,’ Saller cautions, ‘you will irritate the writer and demonstrate the shallowness of your editorial judgment’. Besides, by obsessing over trivia you may miss a more egregious lapse nearby. I’ve seen the evidence of this phenomenon when, on a second pass through a document, I’ve caught a conspicuous error beside a finicky fix. Hence the importance of carefulness, one of three main principles that echo throughout the text – the others being transparency and flexibility. Adopting these values helps buttress all parties against the conflict that can arise when there is a difference of opinion on how best to present the text and serve the reader. Saller’s considerate disposition and considerable experience (not least at the Chicago Manual of Style, whose monthly Q&A she edits) underlie her counsel on handling conflict: both external, such as a clash of goals, and internal, such as when a style rule leads to unclarity. One chapter is written especially for writers, advising on expectations and conduct when one’s work is being edited; there’s a chapter too for freelancers, since some of our concerns differ from in-house editors’. As a host Saller is gracious and entertaining, not shy about supplying eye-opening anecdotes – like the writer late with sources because his wife was ‘holding his research hostage in the end stages of their divorce’. This example serves too as a contrast to the relationship-building that Saller shows is crucial to surviving and thriving in the job. With the book, she hopes to give copy editors ‘self-assurance and a measure of grace’ in negotiating words with the writers we are ‘charged with saving from themselves’. It’s an invaluable work for aspiring copy editors, and a useful one for those more established. Writers – who all edit their own work, to a degree – will also find it illuminating. The Subversive Copy Editor is a wise, witty, and thoroughly helpful companion to the work of editing. You can order it from the University of Chicago Press website or your favoured bookstore. Disclosure: University of Chicago Press sent me a complimentary copy of this book, though with no obligation to review. I’m mentioned in the Further Reading and Acknowledgements sections. * I call this imperative the Typographic Oath. This entry was posted on Tuesday, June 28th, 2016 at 6:36 pm and is filed under book reviews, books, editing, writing. You can follow any responses to this entry through the RSS 2.0 feed. You can leave a response, or trackback from your own site. Yes. A thousand times yes. My last editor was that editor. Tons of rearranging sentences to say the same thing while missing actual errors. It was the most displeased I’ve been with an editor’s performance yet! Oh dear. There’s nothing wrong with rearranging per se, but it shouldn’t be gratuitous or distract from necessary editing work. Reworking comments: yes. Always. In my case, on translations, and there possibly even more than when editing – because there are many more options up in the air – much becomes clear a bit further on. Pruning comments so that they are relevant, understandable (ie the client knows what you want them to do in response) and friendly is probybly even more important for the client relationship than the bulk of the translation itself, for which you’ll never get to explain what you were doing and possibly couldn’t explain it without both you and the client taking some courses in applied linguistics. “At some point it has to be good enough” or as my brother, a long-time newspaper sub, said: sometimes people just want Crap On Time. It certainly holds true for editing: more often than not, when reviewing my comments, I delete some and rewrite others. I can see how it would be even more important as a channel of communication between an author and a translator. Years ago, a then friend was trying to make an extra living as a writer. Unfortunately, his written prose was a dense, meandering, looping, and full of infinite preambles as his speaking style (an ex-girlfriend of his described it as “ten minutes to make a one-minute point”). He finally got something published, but it didn’t sell very well at all. When he asked me why I thought it happened, I told him that he wrote things about five times too long, that the reader got tired and frustrated long before he made his point. His reply was, “That’s the editor’s job”. Clearly, he didn’t understand the difference between editing and re-writing. I’ve seen this on both sides–writers who didn’t get why the editor didn’t make their dense (or overly florid) prose salable, and editors who thought they could re-write the entire piece. From my side I’ve definitely seen situations like this, receiving a text that’s just not ready for editing. It’s as though the writer figured, ‘The editor will fix that’, when really the fixing fell under the writing part of the process. As for infinite preambles: sometimes when a passage is overcomplicated to the point of illegibility, I’ve asked the writer by email to tell me what they mean, as if they were explaining it to a friend, and it comes back almost perfect. The context of formal prose can invoke some perceived need to be writerly that works directly against plain comprehension. This person’s speaking style was the same as her writing, the kind I often had to interrupt to say, “Is there a forward gear in this?” because somebody had to be the bad guy and say it. Good grief, at least get somewhere near making a point! Oops, I meant “HIS writing.” I was thinking of his ex-girlfriend when I wrote that. Sorry! It’s been shown repeatedly in investigations of computer programs that the likelihood of an error is greatly increased in the vicinity of another error. I have no proof that this is true of natural-language text, but I strongly suspect it is. So check for more problems near any comments you’ve already written. I suspect the same, albeit based only on personal experience. It would be useful to see a study on this, given that it evidently applies to computer programs. This book has been on my radar for a long time, but your thoughtful and insightful comments on it has made me want to bump it to the top of my to-read list now! Sounds like a very interesting and useful book indeed. It certainly is. Thanks for your comment, and enjoy the book! That sounds excellent. I usually love anything that has the word ‘subversive’ involved. Serious extra points for the focus on ‘survival’. Oh, yes! I’ve never thought of it in those terms before, but that perfectly describes my teaching style.